(Chicago – July 27, 2018) – Today, the Global Coalition on Aging (GCOA) and Alzheimer’s Disease International (ADI) will present findings from the 2018 Dementia Innovation Readiness Index during ADI’s 33rd Conference at McCormick Place in Chicago. 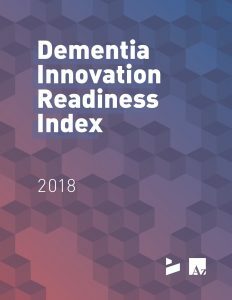 The Index analyzes – for the first time ever – the readiness of countries to develop and deploy dementia solutions into their healthcare, policy and social frameworks. This year’s Index evaluates Argentina, Brazil, China, India, and Saudi Arabia. On a 0-10 scale, with 10 being the highest in terms of innovation readiness, scores were as follows: Argentina – 5.3, Brazil – 5.0, China – 6.1, India – 5.1, and Saudi Arabia – 5.9. Under-diagnosis is a barrier to fully understanding and treating dementia. Better diagnostic tools and healthcare professionals specializing in geriatrics and dementiawill be critical for ensuring countries can adequately address the individual and societal burden brought by Alzheimer’s and other dementias. In Brazil, for instance, community health workers are trained to identify signs of dementia and refer patients to specialists. The regulatory environment has been slow to evolve with the urgency of the disease. Well-funded and efficient regulatory agencies must be prioritized to ensure therapiescan reach people with dementia in a timely manner.